Gain operational oversight over your entire event. It can be hard to keep track of how your event is doing, especially when there are several people on your event team. 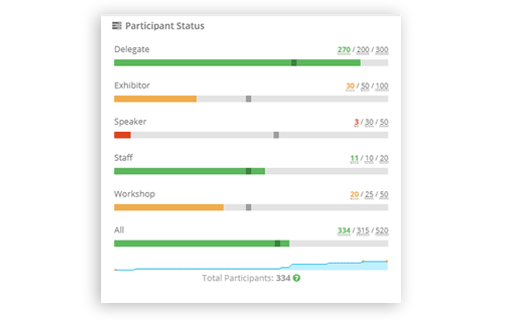 ClearEvent’s Event Dashboard shows at a glance the status of your whole event. Colors pinpoint what needs attention. Drill into key metrics to learn more and address burning issues quickly. Monitor actual event registrations against your own registration targets to see if you are on track to meet your goals. 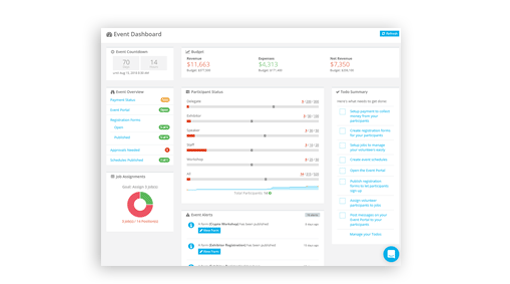 Always know if your event budget is on track with our dashboard budget widget. Our smart event budget automatically stays up-to-date as tickets orders and registrations are received. See Your Event At A Glance.